Last weekend the New York Times Magazine featured an article about the typeface that will eventually grace its presence on all of the highways in the US. 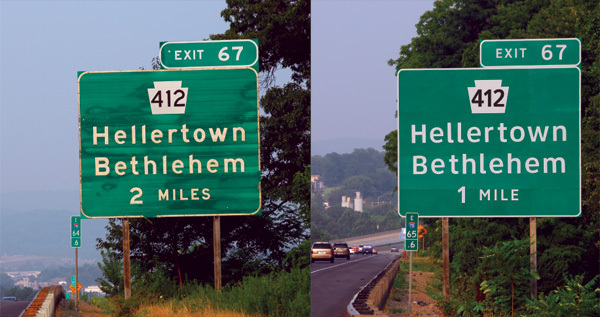 It’s a nice little article about the history of signage for the US Highways. The previous family of typefaces used by the Federal Highway Administration was known as Highway Gothic. The new typeface that’s slated to replace it is Clearview. The picture below shows the old Highway Gothic on the left and Clearview on the right. Clearview was designed by Don Meeker and James Montalbano, with an eye for readability at 70mph. According to their studies, Clearview is quite successful. In nighttime tests, Clearview showed a 16 percent improvement in recognition over Highway Gothic, meaning drivers traveling at 60 miles per hour would have an extra one to two seconds to make a decision. That’s a lot of time on a highway. Graphic Design at 70 M.P.H. Vinh has posted some really nice photos of the print version of the story. It’s a shame I missed the print version. The layout is quite nice. I might just have to go find myself a copy.